– Air View: information appears when you hover your finger over the screen. 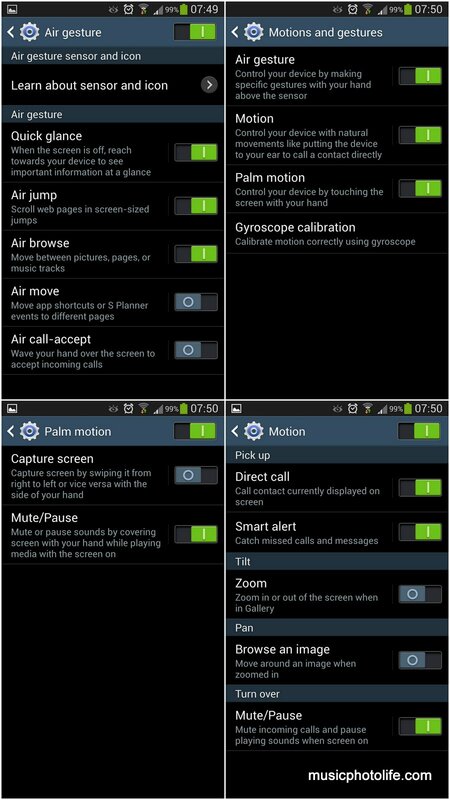 – Air Gesture: Quick glance, Air jump, Air browse, Air move, Air call-accept. Some of the functions are rather useful, but here’s the issue: not all works on apps. Air jump and Air browse: swipe your hands over the air and scroll the web page or photos. Only works on stock browser, stock gallery app. Air View: works on stock Messaging, Email, Calendar, Contact, Gallery. Also works with Flipboard, surprisingly. I find this the most useful touch-free feature as lots of apps support this feature compare to the rest. Smart stay: works on stock Video Player. While it sounds useful, this feature becomes an irritant when many people are watching the video. Often, the feature fails to detect a face among the people and then it would pause playback. Fortunately, you can easily enable and disable the gesture features via the dropdown menu. My verdict: the touch free features are not deal-breakers, but they might help you interact with the phone when you don’t want to touch your phone with your soiled hands.